It’s early September 2005 and 35 Bongos have gathered at Porth Beach, Newquay, to laze around in the dying embers of a typically English summer. Dennis Mulligan made a late decision to come down to the meeting and drove overnight from his home in Manchester to the gathering. At 2am, following a couple of hours kip in a service station on the M5 near Bristol, he peered in to the gloom and saw at the other end of the car park another Bongo. He could see some interior lights on and went to introduce himself. David Walker turned out to be an interesting chap. The day before he had successfully won a bid on ebay for a Bongo (sight unseen) and had flown over from Belfast to pick it up. In total he had driven about 7 miles when Dennis knocked on the door. Later that morning they were amongst the first Bongos to arrive. And by early evening the place was starting to fill up. I was intrigued by David’s tale, and he told me all about it in the pub that night. He said he had been looking at buying a Bongo for some time, but there were no dealers in Northern Ireland. When he saw a Bongo with no reserve come up for auction on ebay, he took the plunge and eventually secured it for £4,500 and then went over to Bristol to pick it up. I cast my far-from-expert eye over it and in my opinion David had picked up a real bargain. And as if by magic coincidence, the name of the live act in the bar across from the campsite that night was…. Which I thought summed David up! 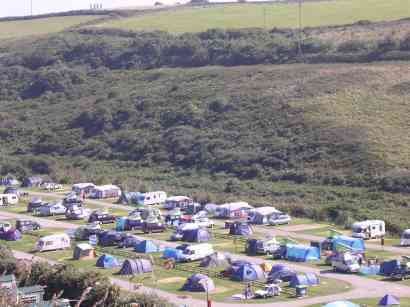 The Porth Beach site was excellent, with beaches and shops all within walking distance, level camping and top notch shower/toilet block. Generally the weather was very kind to us, although a fierce wind did get up at times as it came howling down the valley. Pictured below are Bongonauts Pat & Lisa Phelan, displaying 101 reasons why you shouldn’t expect a £10 gazebo to be too robust in the wind! It may be good for hang gliding, but it is crap as an awning!